While children are scribbling out detailed letters and wish lists to uncle Santa, treats and gifts are popping up in office desks and homes, delivered by stealthy, sneaky and often very generous Secret Santas. Good people around the country, with their hearts swelling with love and generosity, are setting aside money and time to buy special Christmas gifts for their dear and loved ones, just to give someone else a brighter, joy-filled Christmas. In the spirit of the season. we set out to find out the emirate affected the most by all the excitement. We found that, for scores of reasons, Dubai is the best place to celebrate Christmas, followed by Abu Dhabi and Sharjah. Ras Al Khaimah, Fujairah, Ajman, and Umm al-Quwain finish up the list, in that order. Dubai stands out among the emirates with an extensive list of party options and destinations that host special Christmas celebrations. Let’s explore some below. Christmas is nothing if not an occasion for friends and family to be merry together. The best way to celebrate Christmas, then, would be to host a party with all the cheer of the season. Not only would it give you a chance to shower your loved ones with lots of love, food and festivities, it can also turn out to be the main event of the year for you. If you are seriously considering hosting a Christmas party, mypartycentre.com has a lot of Christmas decorations and paraphernalia for you to choose from. Located at The Address, Dubai Mall, Karat offers its own unique take on the traditional afternoon tea. Enjoy custom-blended TWG loose-leaf tea every afternoon from 3.00 pm to 6.00 from the 26th of September 2017 to 31st January 2018. This premium tea concoction is complemented with a whole host of exquisite cakes, cookies, biscuits and more. This famous multi-cuisine restaurant located at the Taj Dubai offers a carefully selected Christmassy brunch every Friday from 12.30 pm to 4.30 pm. 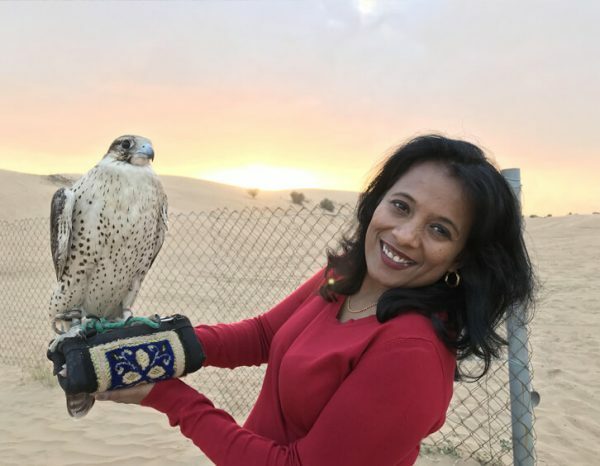 The Irish Village at Al Garhoud calls itself a “piece of Ireland in the heart of Dubai”. Every Christmas, it hosts a special festive buffet with courses and courses of traditional delicacies from the Emerald Isle. And if you’d like a taste of the high life this Christmas season, try out the Al Muntaha restaurant at the Burj Al Arab. Located 200 meters above sea level, and looking out onto the Palm beaches, the restaurant offers you a luxurious six-course Christmas menu to celebrate the season with. Located at the Oberoi in Dubai, Iris takes Christmas celebrations to a whole new level. The Christmas special Le Brunch is complemented by all day festivities, fun and games that include everything from live bands, snow decorations, and delicious seasonal treats. The St. Regis Dubai hosts a special Winter Gardens Market. Featuring entertainment options, select stalls, and themed activities, the market will run from 29th Nov to 26th Dec, every day from 5pm to 11pm (Sun to Thurs) and from 3pm to 11pm (Fri and Sat). Another annual winter wonderland treat for families and friends to get together and get into the merry spirit. This German-style Festive Market offers you tons of games and amusement rides to choose from. The market will be open from Dec 15th to 27th, from 3pm to 1am (Sun to Wed) and from 12pm to 1am (Thurs to Sat). If you would like a true taste of ancient Arabian life, pay a visit to the Camel Race Tracks on the Dubai-Al Ain Road. While races are scheduled almost every weekend during the month of December, make sure you call ahead at (04) 832 6526 to ensure that you have the right timings. Embrace the spirit of the season with the magical winter fairy-tale production at City Walk. The enchanting stories, told by extraordinary artists, flood you with the wonder of the season and take you on a journey unlike any other. While entry is free for all visitors, spending AED 250 at any of the City Walk outlets can get you an unobstructed view. 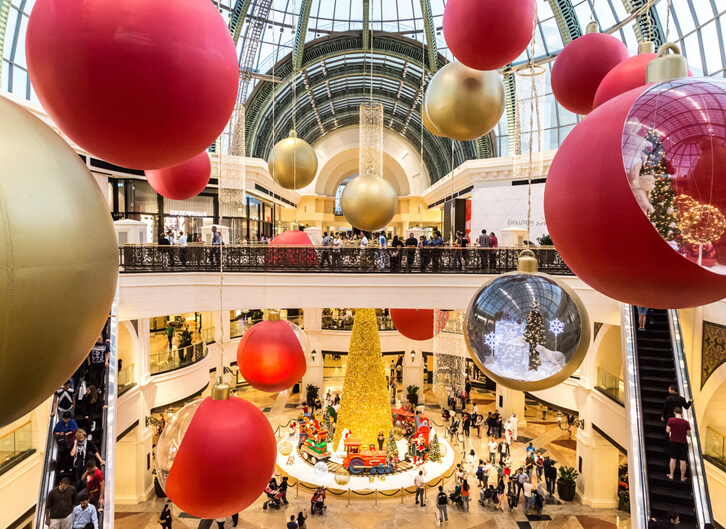 While Dubai is no stranger to shopping and there really is no season when Dubai doesn’t offer up treats and discounts to its patrons, Christmas shopping is a delight in its own way. Whether you’re on vacation, at work or with family, popping into any of Dubai’s malls or souks for a dose of retail therapy can be a wonderful experience. There is no better way to celebrate Christmas than to embrace it in all its glory and rejoice in the coming of the saviour of the world. Take the season as an opportunity to renew your faith and dedication in the Lord by meditating on His word and attending the Christmas mass. To help you out, in the following table, we have compiled a list of churches where you can attend Christmas mass in Dubai. No Christmas is ever complete without a lit up, all-adorned Christmas tree to go with your celebrations. It’s not just a symbol of the season, but also an opportunity for family and friends to get together and paint the surroundings in the colours and the spirit of joy. Whether you’re looking for natural trees or artificial ones, there are a host of online and offline stores to choose from. We set out buy one from these stores and here’s how it worked out for us. This Amazon-owned online store offers a wide range of trees. But the need for an unprecedented amount of lead time (10 days), in spite of providing a specific and detailed GPS location, left us with a disappointing experience. The store was offering Christmas trees right from the second week of the month at 25% discount. But alas, on checkout we discovered that they would take 5 days for delivery. Also, their stocks on real trees ran out on the 12th of December. 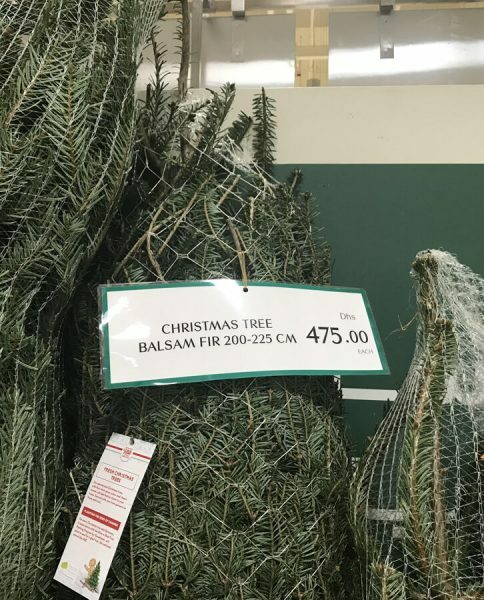 Carrefour has a large stock of artificial Christmas trees that should last through the season. So, if you ever have to put off your tree shopping, you know that you’ve got place to run to at the last moment. 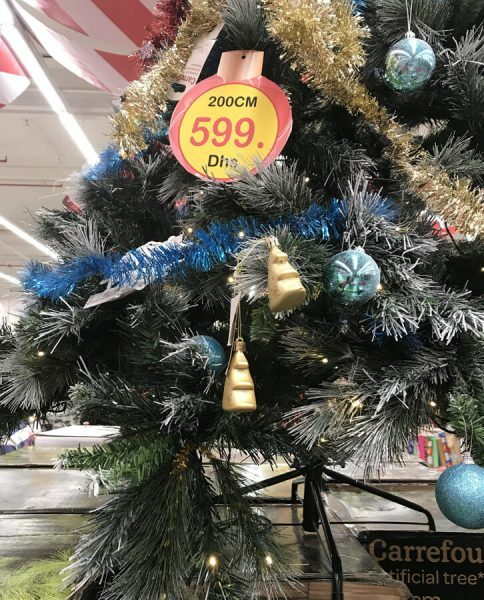 Even this latest entrant into the ecommerce space in the Middle East, is offering a selection on Christmas trees. You can find options of varying sizes and styles. But sadly no natural trees. A value-for-money retail store with multiple locations in malls across the UAE. Of our many options, Daiso offers some of the best quality artificial Christmas trees in the market. In addition to the above, Dubai offers you a whole host of active online and offline retailers with a wide range of Christmas tree options for you to choose from, like Carrefour, Choithrams, Dubai Festival City Mall, Dubai Garden Centre, Spinneys, BlackTulipFlowers.com, and the Satwa Market near the World Trade Centre. A Google Search for Christmas trees in Dubai can pull up an even larger list of active advertisers as shown in the image below. At the end of the day, however you choose to celebrate Christmas, remember that the most important thing is the spirit that the season brings with it. Use these last few days of the year to remind yourself of all that you’re grateful for, to renew your faith in God and to reach out to your loved ones. Make a promise to yourself to embrace the spirit of Christmas with all your heart and to fill yourself with generosity, kindness and love for your fellow man.